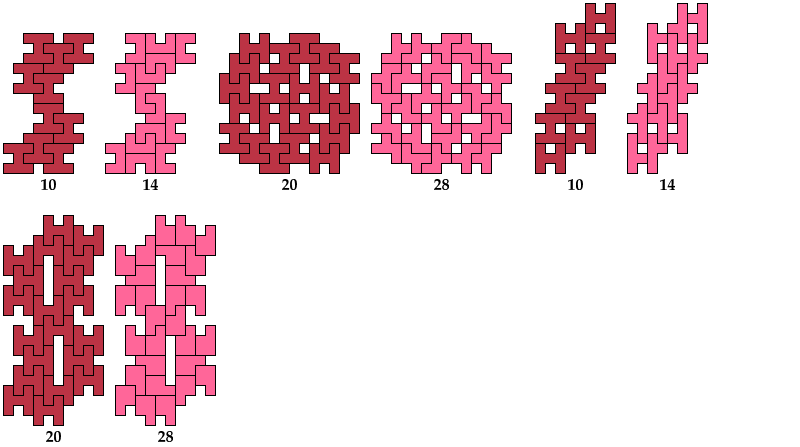 The H heptomino is a polyomino made of seven squares arranged like a capital H.
The compatibility problem is to find a figure that can be tiled with each of a set of polyforms. Here I show minimal known compatibility figures for the H heptomino and other polyominoes. If you find a smaller solution or solve an unsolved case, please let me know. The tromino, tetromino, and pentomino cases were solved by Giovanni Resta and can be seen at his monumental website Polypolyominoes. Mark Smith suggested this page.